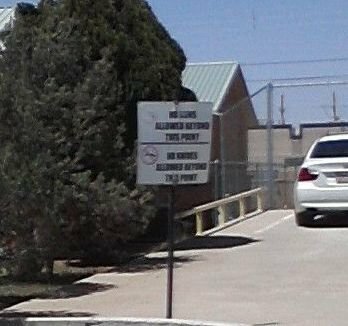 Because I know you can't read it, it says "No guns allowed beyond this point" and "No knives allowed beyond this point". Without signs to remind me that, yes, there really are people so incredibly stupid that they believe a sign will prevent a bad guy who wants to hurt people from doing so, I might forget and believe people are as rational as most of the people I actually interact with. I think it's the back side of the VA center (or whatever you call it). I've come to think most signs are placed for the benefit of the poster, not people who are expected to actually see the sign. There's something about human nature [oh, I know YOU are exempt from this :-)] that relishes the idea of having "authority". "Replace Tools To Their Proper Location When Finished". "Due To Non-Compliance This Rule Is Rescinded"